COMPLETE SELECTION: We have 8 sizes & 19 models. This model comes with an attached high quality 5 FOOT WATERPROOF CORD. A similar model with a 16 foot cord is available. Comes with adjustable input flow-rate screen and 2 outlet adapters for 1/4" & 1/2" inside diameter tubing. DURABLE QUALITY: Our Polished Aluminum Oxide Ceramic Impeller Shaft and Bearings insure long pump life because they are non-corrodible with hardness more than 3 times that of stainless steel. Epoxy Resin Encasement of key internal motor components prevents unwanted conductivity and corrosion of metal parts. 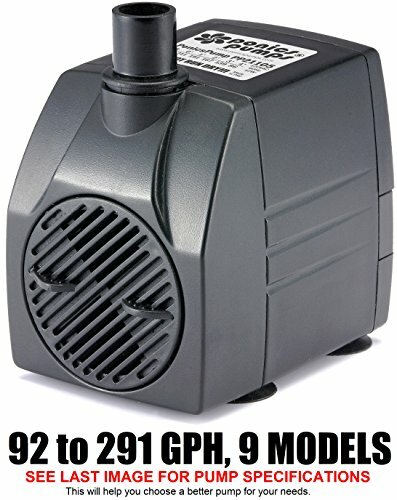 This pump incorporates a magnetic wet-rotor design, so there is no seal to fail that would damage the pump motor. SAFE & EASY: Safe for fish with no exposed copper and oil free. Easy to clean with no tools required to disassemble and remove the impeller/rotor. Our waterproof SJTW Electric Cord has 18 gauge copper wire, molded plug with ground and a heavy duty flexible vinyl jacket which resists oil/grease/moisture/abrasion with very good flexibility at all temperatures.